Baojun Niu, a national actor, graduated from the performance department of the Central Academy of Drama. Baojun Niu starred in a number of films and TV dramas such as Battlefield Bloopers, Dog Bats, Datang Wenzong, Swordsman, Ultimate Conquest and Jedi Gun King. “Court in the Sunshine” CCTV premiered to create a large-scale legal drama The large-scale rule of law drama “Court in the Sunshine” produced by CCTV, the Supreme People's Court Film and Television Center and Qingdao Dong Tang Film & Television Co., Ltd. will land CCTV at 8 o'clock tonight. Comprehensive channel. Many talents such as Yan Bingyan, Zhifei Wang, Bing He, Zhibing Liu, Ruth, Muchen Tian appeared; Tanji Quan, Zheng Hongxing, Li Jutao, Li Jutao and Chen Lijun took the lead. The super cast lineup, coupled with the blessings of professional behind-the-scenes teams, has caused viewers to look forward to the play without launching the show. 40 Senior Bone Blasts The super lineup of performances has a number of “Best Actress” award-winning actress Yan Bingyan, who plays the role of Provincial Senior People’s Court President and the second-ranking judge Bai Xuemei in this drama. This is also the first “church” in the real sense of the rule of law in the country. The heavyweight actor and Yan Bingyan’s old partner Wang are the same as “the judge”. “The court under the sun” is scheduled April 8th CCTV set a prime time to take root life to face the reality of the reality of the theme of the law drama “the court in the sun” census CCTV CCTV rule of law drama “the court in the sun” finalized April 8 The day will become a new benchmark for realistic TV dramas. 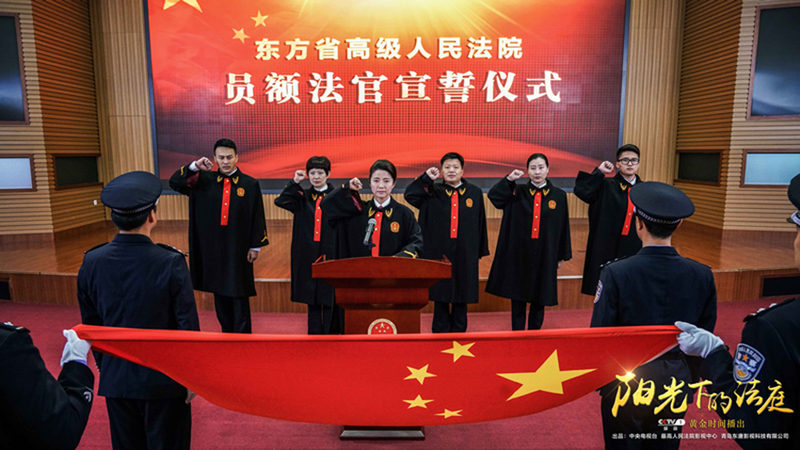 The 36-episode television series “Court in the Sun” produced by CCTV, the Supreme People's Court Television Center and Qingdao Dong Tang Film & TV Co., Ltd. will start on CCTV's integrated channel in prime time on April 8. Grand launch. The drama is starring Yan Bingyan, Bing He, Zhifei Wang, Zhibing Liu, Ruth, Muchen Tian, ​​Jingsheng Liao, Xiaojie Tian, ​​Jinglin Guo, Anlian Yao, Xiao Song Yuan, Baojun Niu, Gao Ming, Ping Ru, etc. ; Tanji Stephen Quan, Zheng Hongxing, and Li Jutao’s screenwriter, Li Jutao, and Chen Lijun directed the film. This is after the establishment of the Central Radio and TV Station.